Some people get fired up about New Year’s resolutions; others write off the idea of well-intended but poorly planned goals. Whichever of these camps you happen to fall into, you probably have a few things you’d like to work on or accomplish – and why not start now? If you’ve been meaning to quit smoking, there really is no better time than the present. And while starting in January might seem corny, it’s a rare time when other people will be trying to do the same thing as you. In fact, the University of Scranton found that “quit smoking” was among the top 10 resolutions made by people in the U.S. in 2014. In front of that? “Lose weight” took 1st place, and “stay fit and healthy” came in 5th. We’ve already discussed how to lose weight and maintain a healthy body – and quitting smoking is a gigantic step in the right direction if you’re trying to be health-conscious. See it and believe it: smoking damages you inside and out. It can be difficult to grasp the significance or proximity of something that you can’t see or have never witnessed in someone else. Taken in altogether, those things don’t paint a very pretty picture. Less visible but even scarier are the prospects of heart disease and an increasingly weak athletic ability. For many people, quitting smoking turns into a larger quest to better their overall health. And it makes sense – you’re doing your whole body a favor by stopping tobacco use. Why wouldn’t you try to further boost your health at the same time? Any doctor will tell you, though, that the damage does not disappear as soon as you throw away your cigarettes. Even a year after you quit smoking, previous tobacco use can impair your body’s healing capabilities and overall health. Remember that this is a marathon rather than a sprint – and your body will need time to catch up. Think in terms of rewards – not deprivation. At Genesis, we’re all about making our clients feel good – guilt is not always a good motivator. Once you’ve resolved to give up smoking, try to focus on how you can treat yourself well without using nicotine as an indulgence. Give yourself small, daily rewards – like 10 minutes of “me” time when you would’ve otherwise been having a cigarette, or a long bubble bath. And in the long term, think about spending your money on something that makes you feel – and look – good. If you want a long-term goal for smoking cessation, consider treating yourself to a something that will really last: self-confidence. Genesis’s Medical Spa has a variety of treatments to help refresh and revitalize your skin and body. 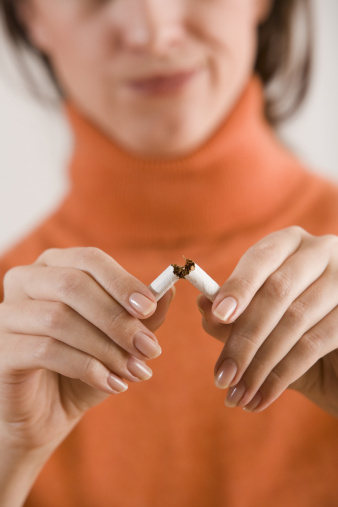 Smoking takes a serious toll on your skin and your body, causing both to age rapidly. You can reverse some of the damage by simply ceasing to use tobacco products; after you’ve successfully dropped the habit and stayed off tobacco for a sufficient time period, we can help you get rid of any telltale after-effects of tobacco use. Note that the staff at Genesis will not recommend any procedures for you if you’ve had tobacco in the past six weeks to three months: smoking and tobacco use can significantly impair your body’s healing processes, and can eventually negate the positive effects of any procedures you want to undergo. Try a Melanage Skin Brightening System to improve the texture and appearance of age spots and uneven skin. Reduce fine lines around your eyes and improve skin texture and tone with the Fraxel-II treatment. The Clear + Brilliant laser treatment helps reduce the signs of aging in skin at any age. Tighten up sagging arms with brachioplasty. Rejuvenate an aged face with a Naturale facelift. Get rid of excess skin or fat deposits with liposuction. While no bodily procedure – whether invasive or non-invasive – should be taken lightly, we think that investing in your self-confidence can have a serious impact on your motivation to quit smoking.